Acts of Faith is a remarkable account of growing up Muslim in America and coming to believe in religious pluralism, from one of the most prominent faith leaders in the United States. Eboo Patel’s story is a hopeful and moving testament to the power of passion of young people—and the world-changing potential of an interfaith youth movement. Acts of Faith is the 2010 recipient of the prestigious Grawemeyer Award in Religion. 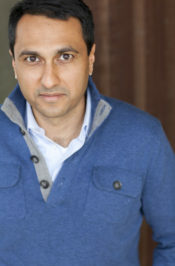 Eboo Patel is founder and executive director of the Interfaith Youth Core, a Chicago-based international nonprofit building the interfaith youth movement. He is a regular contributor to the Washington Post, National Public Radio, and CNN. Named one of America’s Best Leaders by U.S. News & World Report,he was appointed by President Obama to the Advisory Council of the White House Office of Faith-Based and Neighborhood Partnerships. Eboo’s core belief is that religion is a bridge of cooperation rather than a barrier of division. He’s inspired to build this bridge by his faith as a Muslim, his Indian heritage, and his American citizenship. He has spoken about this vision at places like the TED conference, the Clinton Global Initiative, and the Nobel Peace Prize Forum, as well as college and university campuses across the country. He has written two books about interfaith cooperation, Acts of Faith and Sacred Ground. Some people ask if Eboo ever stops talking about interfaith. If it’s any indication, his five-year-old son can define interfaith cooperation. OKCU Reads is new students’ first opportunity to engage with the community of scholars that is central to the OKCU experience. In August, as part of Stars Week: New Student Orientation, first-year students will participate in a series of discussions and activities providing a deeper appreciation of Acts of Faith. Creative Reflections on Acts of Faith. 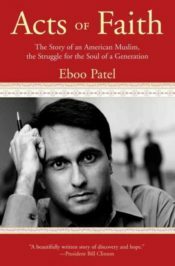 SERVICE, SOCIAL JUSTICE and INTERFAITH describe key elements in Eboo Patel’s compelling story. Each winner will also be invited to attend dinner with the author, Eboo Patel, Thursday, August 20th. Please include your name, phone number, email address, hometown and major.